For commercial card types that can qualify for Level 3 Interchange, address verification, invoice number, tax amount, and line item detail fields like product code, item description, item quantity, unit of measure and extended item amount must be submitted with the standard sales information. In addition, specific Interchange compliance requirements must be managed and include merchant category restrictions, authorization, clearing, timeliness and registration. MasterCard and Visa are continuously making adjustments to both their Interchange rate and qualification requirements. Currently Visa and MasterCard both require submitting a tax amount greater than zero to qualify for Level 2 / Data Rate 2 Interchange rates but for tax exempt transactions Level 3 / Data Rate 3 Interchange rates are available provided data and other processing requirements are met. The difference between the best and worst rates equal $12 in savings per $1,000 in sales. 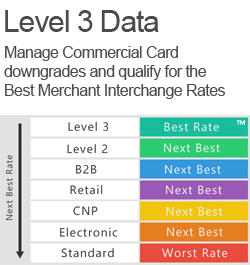 However, the difference between the best and next best rates across the entire Interchange spectrum continues to favor those merchants processing at Level 3. And these savings continue to grow. Contact us for a Level 3 Interchange quote detailing Visa, MasterCard and Discover commercial card rates, qualification requirements and next best rates. Qualifying for incentive Level 3 processing rates while eliminating Non-Qualified surcharge fees may reduce your processing expenses by an average of 15% to 20% and in some cases much more!